The HDMI specification defines the protocols, signals, electrical interfaces, and mechanical requirements of the standard. The maximum pixel clock rate for HDMI 1.0 was 165 MHz, which was sufficient for supporting 1080p and WUXGA (1920×1200) at 60 Hz. HDMI 1.3 increased that to 340 MHz, which allows for higher resolution (such as WQXGA, 2560×1600) across a single digital link. An HDMI connection can either be single-link (Type A/C) or dual-link (Type B) and can have a video pixel rate of 25 MHz to 340 MHz (for a single-link connection) or 25 MHz to 680 MHz (for a dual-link connection). Video formats with rates below 25 MHz (e.g., 13.5 MHz for 480i/NTSC) are transmitted using a pixel-repetition scheme. 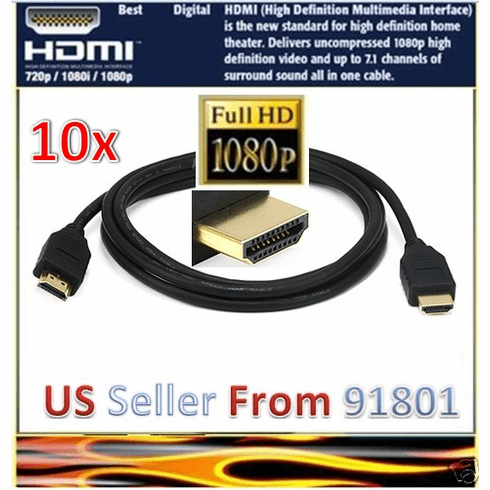 HDMI 1.0 to HDMI 1.2a uses the CEA-861-B video standard, and HDMI 1.3+ uses the CEA-861-D video standard.The CEA-861-D document defines the video timing requirements, discovery structures, and data transfer structure. The color spaces that can be used by HDMI are ITU-R BT.601, ITU-R BT.709-5, and IEC 61966-2-4. HDMI can encode the video in xvYCC 4:4:4 (8–16 bits per component), sRGB 4:4:4 (8–16 bits per component), YCbCr 4:4:4 (8–16 bits per component), or YCbCr 4:2:2 (8–12 bits per component). HDMI supports up to 8 channels of uncompressed audio at sample sizes of 16-bit, 20-bit, and 24-bit, with sample rates of 32 kHz, 44.1 kHz, 48 kHz, 88.2 kHz, 96 kHz, 176.4 kHz, and 192 kHz. HDMI also supports any IEC61937-compliant compressed audio stream, such as Dolby Digital and DTS, and up to 8 channels of one-bit DSD audio (used on Super Audio CDs) at rates up to four times that of Super Audio CD.With version 1.3, HDMI supports lossless compressed audio streams Dolby TrueHD and DTS-HD Master Audio.